YOU are a key piece of the increasingly colorful youth sports puzzle. Without parents, coaches and volunteers like you, the picture of a positive, responsible sports environment for our kids could never come together. And now, you can be an even more vital piece of that puzzle. 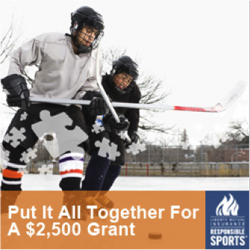 As you and your young athletes eagerly practice and prepare for another spring sports season full of action, excitement, learning and growing – as all the pieces of the puzzle begin to spring into place – wouldn’t it be nice to do so with the added incentive of $2,500 to fund your hockey organization. This spring, teams and clubs around the country are competing to earn the most Responsible Sports points. With just a little bit of work, and a good bit of networking and teamwork, your youth sports organization or school sports program could score enough points to finish as one of our 15 Responsible Sports Community Grant winners this season. It’s easy to apply and get the puck rolling. Just visit ResponsibleSports.com/Grant and register your organization or school program, then reach out to rally parents, coaches and team supporters to go online and review either the Responsible Sport Parenting or Responsible Coaching guide. Then, simply complete the corresponding online quiz, and showcase your mastery of the Responsible Sports concepts. Score Points By Demonstrating Smarts. Each time someone within your organization successfully passes an online quiz, it’s worth a point to your group. Connect with friends, family and neighbors to rally even more support and put more points on the board. The top 5 groups in each of the Small Organization, Large Organization and School categories with the most points at the end of the grant period (May 31) earn the 15 grant prizes of $2,500 each. It’s that simple. Remember…the more online quizzes your group successfully passes, the more points are earned on your behalf. It takes parents, along with your friends and family, to bring the pieces together. So take the quiz and earn a point, assign that point to your favorite team and watch all the points add up! Don’t forget to check out the helpful tools in our Community Grant Toolkit and Like our Facebook page for more resources. Have fun, be Responsible, score points and show us YOU have what it takes to earn a Responsible Sports Community Grant.